Divorce or Separation from your spouse is a painful and mentally challenging thing, we all know. But once you have decided to separate, who can stop you? It is one of the rights you have as a citizen of this country, and above all, you have a personal right to decide for yourself. Reasons for obtaining divorces are many and complicated. This is because; it is you who have experienced that life which you now no more want to continue. However, there is a requirement, in official divorce cases, to mention the reason. The procedure starts with an application in the court of law. This is because Marriages are legally registered. So, dissolution of marriages too has to be legally registered. The divorce may be mutually agreed, where both the parties are co-operating. In such cases it's all fine. But what about cases where one of the spouse is unrelenting on divorce? This is when you can notify your spouse through a newspaper advertisement, about the divorce application. It is a legally approved step which gives either of the parties in a marriage, to legally divorce the other, through a written communication printed in newspaper. This is what we all refer to as "Divorce Notice Ads". This way, you have sent a Divorce notice summon. 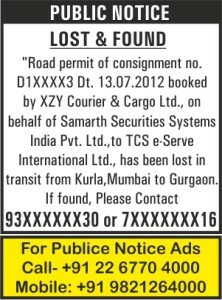 Your ad (summon) will appear in the advertisement section of the newspaper. The legal process to be separated from your spouse is initiated. The rest of it is a upto the court of law to decide upon. As of today, the trial relating to matrimonial dispute cases (Divorces) are completed within six months of time. This is as prescribed by the law. So, a six months time period is all that you will have to wait, until you start your new life again. For any assistance regarding Divorce notice advertisements, you can call us on +91-9821254000 / +91-9821454000 or Email: info@riyoadvertising.com. We will be of assistance to you. We will guide you about the appropriate newspapers that you can choose to make the Divorce summon announcement issued by the court. 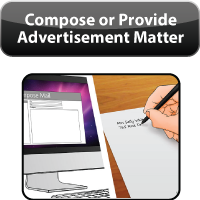 We will not in any way burden you with the advertisement rates. 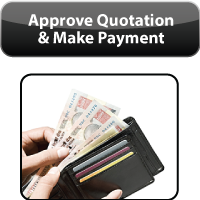 We will put in our maximum efforts to be cost effective to you. We understand what you are going through.